Portable electric heaters can sure be a blessing when that cold snap hits and you need a little extra heat in a room of your house. They also can be one of the most dangerous appliances you may ever use. The danger often occurs at night when you are sleeping and are unaware of the dangerous situation that you have put in play. 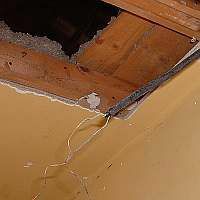 Talking from experience, I have seen a situation where the homeowner plugged three electric heaters on the same circuit, and in a matter of no time at all, the wiring in the house was melting and the wall insulation was smoldering. Smoke was rolling out of the wall and nearly caught the home on fire! As the extreme cold snap takes a grip on your area, many times people are tempted to plug in portable electric heaters to add a little extra heat to rooms. Portable electric heaters are a nice addition to heat these rooms as long as you don't get carried away. The problems start when you connect too many heaters to the same circuit and cause a circuit overload. By overloading the circuit, the electrical wires and connection will heat up and trip the circuit breaker or blow the fuse it is connected to. Obviously there is a problem, but too often, people will just go and reset the breaker or change the fuse. If you reset a breaker too many times, it's likely that you'll weaken the breaker and have to change it. These devices are just doing their job and you're just setting them up for failure if you don't find the problem. In fact, you're likely headed for an electrical fire in your home if you keep resetting the breaker or changing the fuse, especially if you install larger fuses than were in the fuse box to begin with. As you can see in the pictures, the electrical wire insulation breaks down and burns and that in turn causes the wooded walls to smolder and eventually catch on fire. This family was very fortunate that the home didn't burn down due to the smoldering wire and wood. Luckily, the fire department came just in the nick of time to save the home, but not without a cost. The home now has to be remodeled and the electrical wiring has to be updated and changed, not that that's not a good thing. Luckily this happened in the middle of the day while they were all awake and able to see the smoke. If they had been asleep when this had happened...who knows? And while we are on the subject, have you changed your smoke detector batteries lately? Do you have smoke detectors in and around sleeping areas of your home. Are they hardwired so that if one goes off, they all sound an alarm? If not, this may be the time to get prepared for a fire in your home. To avoid electrical fires in your home, be sure that all the electrical connections are tight. Make sure that cord are plugged all the way into an outlet and that that connection is secure. Too often, outlets become worn and they loose their tension strength. This causes the cords to fall out or hang half out from the outlet. This in turn is like adding a resistance to the circuit and causes it to heat up. And of course, you know the rest of the story. Electrical safety is a 24-hour, seven day a week job. Practice electrical safety everyday and it will become a routine, not a chore!